The spirits behind the art ? 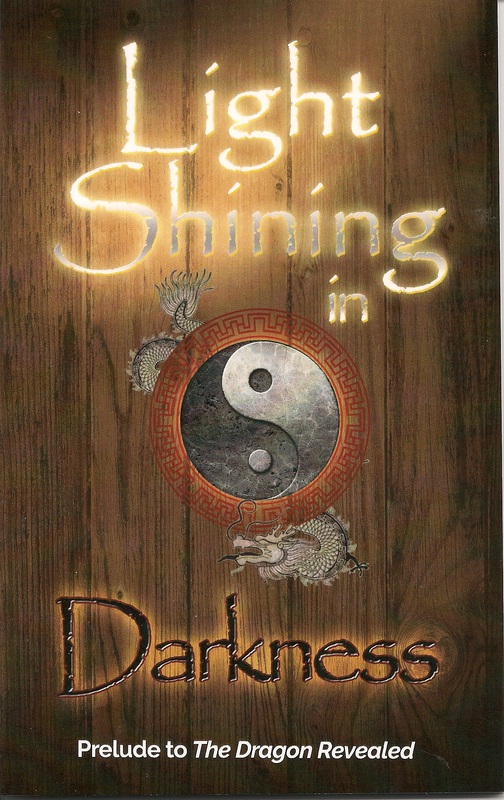 Light Shining in Darkness – a True Story ! Star Wars – Pantheism repackaged for this generation? Pantheism repackaged for this generation? Little by little he has prepared the way for his master-piece of deception in the development of Spiritualism. He has not yet reached the full accomplishment of his designs; but it will be reached in the last remnant of time ! Says the prophet: “I saw three unclean spirits like frogs (tongues, words, messages) . . . they are the spirits of devils, working miracles, which go forth unto the kings of the earth and of the whole world, to gather them together to the battle of that great day of God Almighty.” Revelation 16:13-14 and Revelation 19:17-21. *note – CLICK HERE to see The Dragon Revealed ! This new 64 page booklet is the perfect resource for sharing and literature evangelism. With full color cover and back, the booklet includes a powerful overview of the dangers and spiritual powers which are working behind the scenes to prepare the whole world for the last great deception, just before the return of our Lord (Sovereign King) and Saviour Jesus Christ ! Text includes more than forty-two illustrations; and brings the reader to the very last message of love and warning to be given to this world . . . in the Loud Cry of the 4th angel, and the Glad Tidings of the righteousness of Christ by faith ! Please contact us here at Isaiah Ministries, and Little Light Studios to orde r copies today. *note: ask about specials available for bulk orders. “And Jesus answering saith unto them . . . Have faith in God ! Speakers from around the world will share their experience of the dangers of spiritualism, mysticism and the occult; and of the unfailing power of our Mighty God to rescue, deliver and to save ! https://www.youtube.com/watch?v=EStem4T6bAw – The Time is Now ! This year’s Prayer Conference will be our 3rd International Event. And will be held at Mount Hermon Christian Conference Center, Mt. Hermon, California, USA. Previous Conferences in 2012 at Wonju, Korea and again in 2013 at Saitama, Japan, have been powerful and inspiring, with attendance growing each year. We praise our LORD and Saviour to see such interest and participation, as men and women of God “watch, pray and work” together (5T, p.235) to prepare our hearts and those of our families to be ready to meet our Lord. May our LORD and Saviour bless and keep you abundantly, according to the unfailing power of His Life-giving Word ! Subtle Seduction – Modern Miracles and an Ancient Illusion ? We thank you for your prayers and your support. For the LORD has blessed above and beyond all that we could have asked or even imagined. During our 3 week trip with Steps to Life of sharing the Glad Tidings of the freedom which has been given to every child of God, through faith in Jesus Christ, we have seen the LORD’s hand in mighty ways ! We also thank the entire team of Steps to Life Australia for all that they did to make this series possible. For not only has the last days danger of spiritualism and Eastern mysticism been revealed to thousands of God’s children, but many more have for perhaps the first time taken hold of Christ and the victory and freedom which He lived, died and rose again to freely give to all who are willing to believe ! This new 6 part series has been specially prepared for Eric and Sarah’s 2016 visit with Steps to Life of Australia. The series presented and filmed there in Melbourne, Sydney and Brisbane contains 80% new and updated materials not included in the original film sets from Little Light Studios and Amazing Discoveries. Part 4 greatly expands on the pagan roots of many of today’s holistic and alternative energy healing methods. Practices such as acupuncture, Reiki, kinesiology, iridology, Ayurveda, qigong and aromatherapy are examined closely, along with the history and spiritual background of their founders. It is our prayer that what you learn here will help to shed Light from God’s Word on many of the practices coming into the Christian church under the guise of alternative health and healing. Please contact Little Light Studios or Steps to Life Australia at the links below to order the full 6 part series on DVD, or to watch by digital download. Eric began training in the martial arts at the age of fourteen, just after his parent’s separation. Searching for meaning and purpose in his life, he began his journey on a path which promised assurance, confidence, and self-control. Over the next 24 years of training, Eric received black belt and instructor certification in seven styles of the combative arts. He was inducted into the USA Martial Arts Hall of Fame. With a background in natural and alternative medicine, Eric studied extensively in the field of energy healing. He was recognized as an instructor in the Chinese internal arts of Tai-chi Chuan, Bagua Zhang, Qi-gong and Traditional Chinese Medicine. The life he lived was to all appearances a success. but through the years involved in these Eastern mystical arts, Eric had become blind to the forces which had set themselves to destroy both himself, his wife Sarah, and their children. Their marriage crumbled . . .
Then a miracle happened which would forever change their lives. After nearly five years of separation and divorce, the Lord Jesus Christ, in answer to the prayers of faith reunited Eric and Sarah in the covenant of marriage, restoring both their family and their home. Eric shares the miracle of how God opened his blind eyes, and delivered him from the powers of darkness. Today, Eric and Sarah’s lives are dedicated to sharing the Glad Tidings of the Salvation and freedom in Christ which we have each been given through faith in Him . . . Of His love and His power, and His great desire to set every captive free ! If you are interested in scheduling a speaking engagement or seminar; or if you have questions or are in need of prayer, please feel free to contact Isaiah Ministries at the address on our contact page. May the LORD (Jehovah, Yehuwah) both bless and keep you, strong in faith and the unfailing power of His Life-giving Word ! 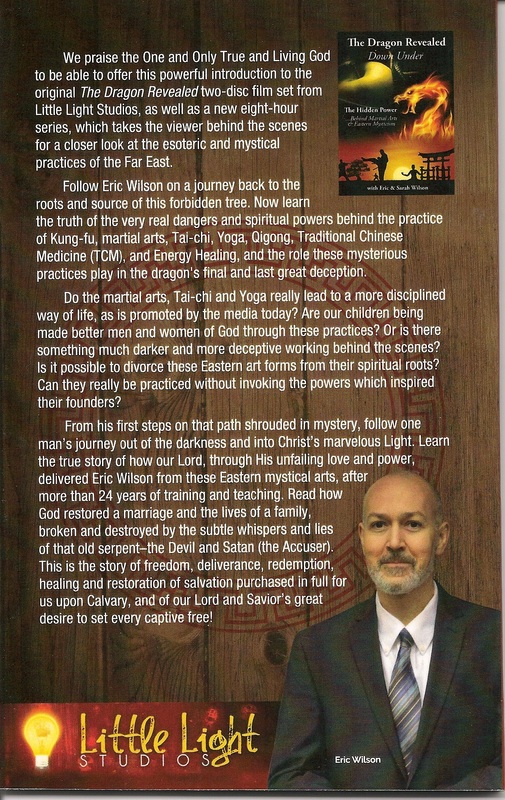 Questions and Answers – martial arts, tai-chi, yoga and the Christian ? What is the true source of power behind the martial arts? And what are the very real spiritual dangers of these mystical practices? Today, these arts, as well as Tai-chi, Yoga and Qigong, are being marketed as merely physical exercise, self-defense, and relaxation . . . . but is this in fact the true purpose of these practices? And can these eastern art forms be safely blended with Biblical Christianity? “Today the mysteries of heathen worship are replaced by the secret associations (societies) and seances, the obscurities and wonders, of spiritualistic mediums. The disclosures of these mediums are eagerly received by thousands who refuse to accept Light from God’s Word or through His Spirit. Believers in Spiritualism (and spiritism) may speak with scorn of the magicians of old but the great deceiver laughs in triumph as they yield to his arts under a different form. There are many who shrink with horror from the thought of consulting spirit mediums, but who are attracted by more pleasing forms of spiritism, such as the Emmanuel movement. Still others are led astray by the teachings of Christian Science, and by the mysticism of Theosophy and other Oriental religions (martial arts, Qigong, yoga, acupuncture, reiki, iridology, kinesiology ect). It is our prayer that what you learn in these question s and answers, as well as our 2 disc film set, The Dragon Revealed, will bring you Hope, and Light and Truth as it is in Christ Jesus ! May the LORD God bless and keep you strong in faith, and the power of His Life-giving Word ! Your Help is Needed ? We thank each of you for your prayers and support in the LORD’s work over this last year. Through your help thousands of people have been blessed with Light, and hope and assurance from the Promises of God’s Word ! Now, the LORD (Jehovah, Yehuwah) has opened the door for us to share this Truth and the power of His Life-giving Word with millions of souls across the world. In just a few weeks (January 13-15th), Isaiah Ministries will be uniting with Amazing Discoveries and Little Light Studios to present 5 messages on the spiritual dangers of martial arts & Eastern mysticism to God’s church. Dangers & Deceptions of the Martial Arts ! 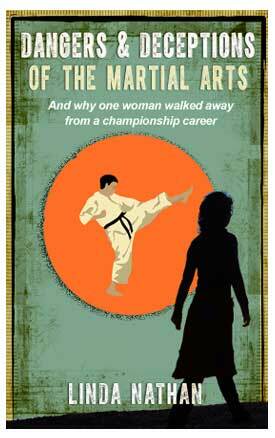 Are you wondering if there’s a problem with involvement in the martial arts? You say your neighbor’s little boy is taking a class, and now your son wants to, too? Several women in your office are learning it for self-defense. And, why, even your church has a class! Perhaps you yourself are involved but feel uncertain and want more information.How can anything be wrong? Little Light Studios and Isaiah Ministries extend our deepest thanks to every brother and sister in Christ Jesus who has lifted us, and this film project in their prayers. And we also thank the LORD God Almighty (Yehuwah El’ Shaddai), through Whom all things are possible . . . . for every gift which has been given from the hearts of His children who were able to help support “The Dragon Revealed” in making this film a reality ! As our gift in return, we are making the first disc of “The Dragon Revealed,” available to all at the link below. We encourage you to share this true story of the love and power of the Lord Jesus Christ with all you can. It is our earnest prayer, that through this 2 disc film set, millions of souls will be won to Christ, and prepared for His soon return in the clouds of glory ! This first disc will remain online, while the 2nd disc will be prepared for shipping within the next 2 weeks. Those who wish to purchase “The Dragon Revealed !” in it’s entirety will be sent both disc.1 & disc.2 when they order the film at the link above. Please continue to lift us and the men at Little Light Studios in your prayers as we complete the final editing, and prepare this full set for shipping. And may the LORD Bless and keep you and those you love, through His mighty power, and the unfailing promises of His Life-giving Word ! The Dragon Revealed – Coming Soon July 17th ! After more than 4 years of diligent work, the men at Little Light Studios & Isaiah Ministries, are happy to announce the release of our new 2 part film, The Dragon Revealed ! The release date is set for July 17th, and we ask for your prayers over the next few weeks as we make the final edits so that the film will be ready. Please also, above all else, pray for every soul who receives a copy of this film. It has been our greatest desire that all will learn through this story, of the love and power of the Lord Jesus Christ, to deliver and to save to the uttermost, all that come unto God through Him ! http://littlelightstudios.tv/projects/the-dragon-revealed/ – Film information and orders ! And the timing is none too soon ! With spiritualism and eastern mysticism infiltrating our homes, and even many once fundamental churches through media and literature, the Truths contained in this film are needed now more than ever before ! We thank you with all of our hearts for your prayers and support on this project. Please share this link and preview with all you are able, and contact us if you have any questions, or to preorder a copy for your church or family.May the LORD Bless you abundantly with His Spirit and grace ! The ARRIVAL – An Overwhelming Surprise! The Miracle of Our Victory and Righteousness at Calvary ! Alpha & Omega – the Eastern Roots of Spiritual Formation !